Reynolds and Associates is proud of the hard work from our clients. One client that I would like to highlight is the Great Heights Brewing Company, which serves the Houston area with a robust craft beer selection. Our CPA firm began working with this Houston brewing company at the end of 2016 as they were preparing to open for business. They opened their doors in August 2017, just in time for the Houston Astros stretch run and the start of the 2017 football season. 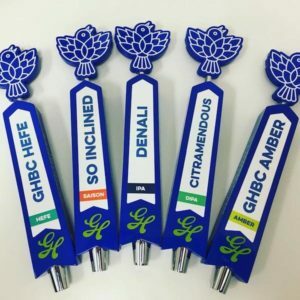 The Great Heights Brewing Company (GHBC) is a combination taproom and production brewery allowing customers to enjoy authentic craft beers produced right here in Houston. To celebrate our client’s grand opening, our team visited the establishment to sample their offerings and experience their location firsthand. Reynolds and Associates was bubbling with excitement to host a happy hour event at the Great Heights brewing location in October 2017. Our entire firm attended, allowing the team to visit the facility and appreciate our client’s hard work launching a new business. For many team members, it was their first opportunity to visit the brewery. During the event, our firm enjoyed a variety of craft beers as well as delicious ribeye steaks provided by local Houston eatery Buck’s BBQ. The experience also captured the importance of community businesses working together. GHBC is a member of the Greater Heights Area Chamber of Commerce, of which our firm is also a card-carrying member. Because of our mutual connection to the Chamber, we enjoyed working with GHBC to support their needs opening a new business and ensuring they were properly set up for tax and accounting purposes. There are a multitude of items on the checklist for any start-up business, especially brewing companies in Houston. Do you have a location? Do you have a license to operate? Have you set up payroll? To start answering those typical start-up questions, Reynolds and Associates provided tax planning and strategy implementation services to GHBC. That was essential to help the brewery take a step toward officially opening their business. We followed by providing three more essential services: tax preparation, business best practices consulting, and QuickBooks Online assistance. Our firm has achieved the status of a certified QuickBooks ProAdvisor, allowing us to provide advanced level accounting services and recordkeeping for our clients. We were able to set up the GHBC with optimal start-up accounting to ensure they were prepared for their first tax season. Peace of mind and their hard work was worth celebrating at our happy hour event! Whether you are running a start-up or have been in business for years, contact us today to find out how our CPA firm can also support your accounting needs.